His condition is worsening now, the NY Sun is reporting he has gone into Intensive Care as his liver is failing. Thallium is frequently referred to as the poison of choice: Only a gram of the colorless, odorless, water-soluble heavy metal can kill. It is as toxic as arsenic, and even more so than lead. Col. Alexander Litvinenko, a former KGB and Federal Security Service agent, was under armed guard at a hospital Monday, fighting for his life after being given the deadly poison in London. 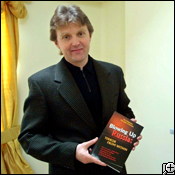 Litvinenko's white blood cell count - generally used as a gauge of the immune system - is down to nearly zero, said Dr. John Henry, a clinical toxicologist involved in his care. Col. Alexander Litvinenko, a former spy, an author and an outspoken critic of Russian President Vladimir Putin, said he fell ill after meeting with a contact over a sushi meal while probing the murder of Russian journalist Anna Politkovskaya. [..]British news outlets identified Litvinenko's contact on the day he fell ill as Mario Scaramella, an Italian academic who helped investigate KGB activity in Italy during the Cold War. Scaramella could not immediately be reached for comment. Alexander Goldfarb, a close friend of Litvinenko who helped him defect to Britain, said he suspected the former spy had been targeted by the Russian government.